I was strolling through a book store yesterday and noticed that the Fat Cat books are still on the shelves! I asked my good friend Chase Oliver, the star of those books, how they were doing. She says they still sell well, even though the publisher has cancelled the rest of the series. The three that are out are not, we are all happy to say, out of print! As long as you read us, we’ll have life. While Kaye George (the person who is also Janet Cantrell) is working on her next series, Vintage Sweets, I decided to ask her if she’d be willing to give away a Fat Cat book. She said yes! This is Janet speaking. (Or Kaye, if you prefer.) I’m so happy to see my Fat Cat books still winging out to new readers and I’d like to make another new reader. 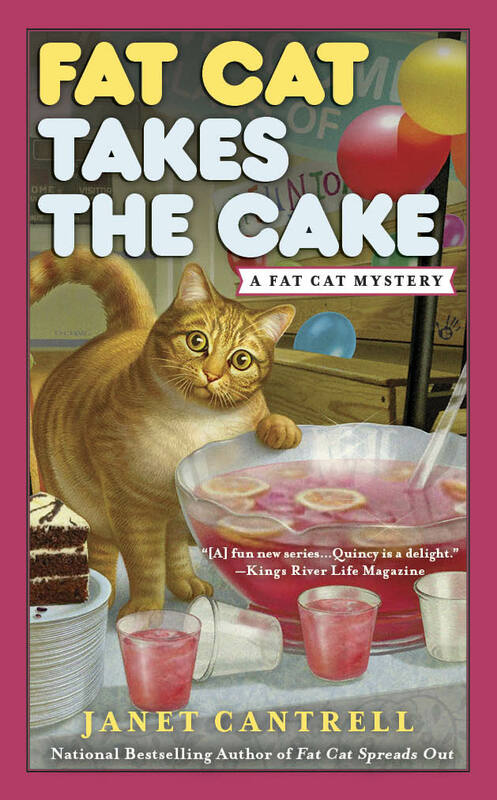 If you’d like to win a signed copy of the third one in the series, FAT CAT TAKES THE CAKE, please leave a comment below and include your email address. I’ll pick a winner at the end of Monday, the 7th. At around midnight EDT. I'd love to win a copy of FAT CAT TAKES THE CAKE! Happy to see the series is still selling and a pox on the ex-publisher! I Would love a copy. Thanks so much for the chance. I looked up this series on Goodreads and this book looks good. Love cozies with cats. Would love to win a copy. Thanks for your generosity. I would love a copy of this book. Publishers have really lost their perspective with all the series cancellations. Love this series. So sad there won't be more. Would love to win a copy. As the proud owner of a "not so skinny kitty", I would LOVE to win this book. Well, the kitty actually owns us :), but I would still LOVE to win this book! I love this series! I can't believe the series was cancelled. I have an orange tabby kitten named Jefferson and I really love the cat on the cover. Thanks for the chance. I am so glad they are still out there. I would love to read this one. Thank you for the chance. My own fat cat would love for me to win this book so I could read it to him. I would love a signed copy. Thanks for the chance. Sorry to hear there will be no more. This sounds very good and she's a new Author for me, thanks for the chance. Anything with cats is always fun-- thanks for the opportunity!